"It's been said that our sense of smell is deeply tied to memory. Bring this recipe to a simmer on your stove top and the smell will have you reminiscing about holidays past and definitely enjoying the present!" Boil water in a large pot. 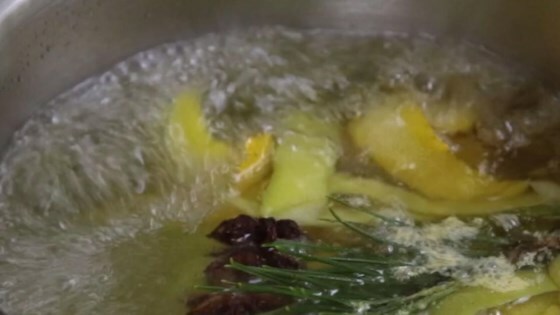 Add orange peel, apple peel, lemon peel, cinnamon sticks, vanilla extract, star anise, and pine sprig to the pot, reduce heat to low, and simmer. Check water levels every 30 minutes, adding water as necessary, to keep mixture simmering 8 hours to all day. Although this soup smelled really amazing, the cinnamon sticks were too difficult to chew...even after simmering all afternoon. Will have to try it with powdered cinnamon next time. LMullins, don't think you are supposed to eat it. it's more of an aromatherapy kind of thing. love this! I did not make any changes and I would make it again. Coincidence or not my house sold.